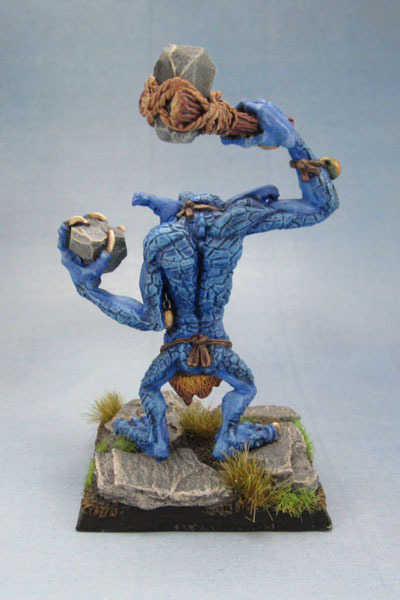 Citadel Stone Troll with Axe – (1992) | Azazel's Bitz Box. Another troll today. 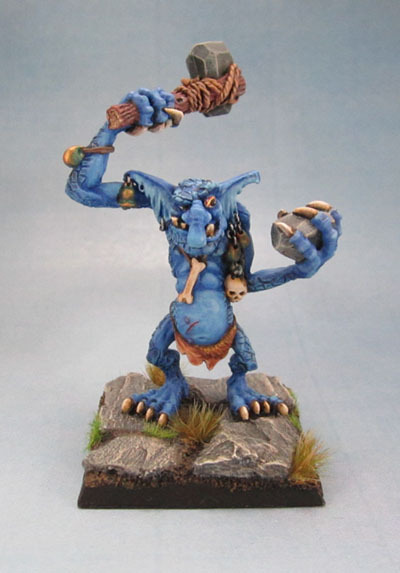 This figure is one of Michael Perry’s efforts that redefined the look of Warhammer Trolls back in 1992 for 4th Edition. 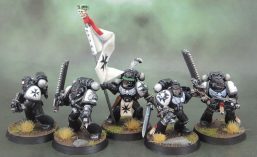 So leaving that narrow era of 3rd that “purists” feel is “Oldhammer”. With 4th Edition WHFB, the armies began to be overhauled and have their looks unified in many ways, putting an end to the “rough and ready” and slightly chaotic look that forces and their ranges had previously. The old C20 trolls were retired and replaced with the new “Stone Trolls” and “Swamp Trolls”, sculpted by Michael Perry. Although the Swamp Trolls were superseded a few years ago by the plastic River Trolls, four of the original six of these Stone Troll sculpts are even still available today, some 23 Years later, including this guy. (One of the rare times I don’t mind comparing my own paintwork directly with the official GW paintjob!) Still, that’s one hell of a distinguished time of service on this model. I first started on this guy 5+ years ago, at the same time I started on the other blue C20 trolls. As with the “Hill Troll”, this guy got “left behind” and was never finished. Since I managed to finish the Hill Troll a couple of weeks ago, it motivated me to pluck this part-painted guy off the desk and finish him off. All I’d done was the base, the basecoat in blue with a wash and drybrush on his cracked back texture – no details. I’ve gotta say that I really enjoyed finishing him off, and if I weren’t in the midst of a self-imposed moratorium on starting new models, I’d be all over the rest of these which I’ve got tucked away somewhere. The more recent Stone Troll towers over his older C20 Brethren. As you can see, this guy is much larger than the older models. As KoW uses regiments of 3 and 6 in size for Trolls and I already have 6 of the older models ready to go, if I manage to use him in a game before I paint up some more, he can be used as a Troll Bruiser (Hero). This entry was posted in Age of Sigmar, Kings of War, Oldhammer, Orc and Goblin Army, Warhammer Fantasy - 9th Age and tagged Stone Troll, Warhammer, WHFB, WHFB 4th Edition. Bookmark the permalink. Thanks Ann, I always enjoy looking into the background and doing a little reminisce about the older models. Makes the whole blogging thing more interesting for me. Those stone trolls are fun models, I’ve been meaning to add them to my goblin horde for the last… 23 years apparently. Actually fits in nicely with the older sculpts, given the same paint scheme. I really like how they’ve come together, with the blue classic stone troll skin and standing on those weathered rocks with the tufts growing in between. I don’t think the 4th edition troll really looks larger, the others are just in stooped poses with bent knees. Funny how the time flies, eh? The initial plan (years ago) was for a WHFB unit of.. 4 or 5? which was to be a combination of the three C23s and a couple of these guys mixed together. I added the swamp tufts to create a consistency between these guys on their slate bases and the other models on regular dirt bases. The photos hide it a little, but the Perry Troll is noticeably bigger than the older ones in hand, even allowing for the stooped poses (which just emphasise it even more). Not by a huge amount, but you can see it in the limbs and especially the torsos. 23 years for a sculpt to be in production is a real testament to the quality of the design imo… Your painting certainly does this classic justice mate! Excellent paintjob per usual. I really like the rock base, just fits well with the dudes weapons of choice. The skin texture on the back of the bad boy is nicely brought to the fore by your painting. Thanks mate, this model and the C23 with the rock overhead were the ones that spurred me to buy that first batch of resin-slate bases. It’s worked out well for them and a bunch of other models besides. Thanks Ann. 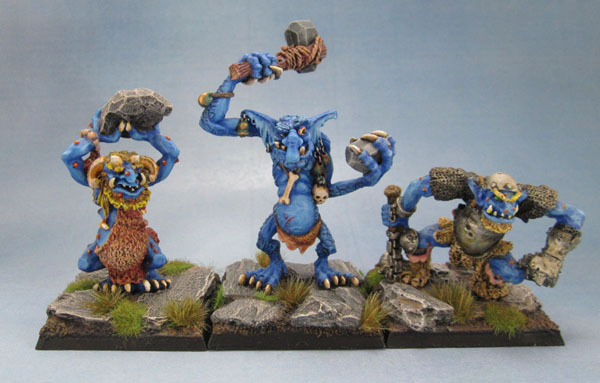 The rocks on these guys are what gave me the idea of purchasing slate bases for the trolls and pretty much basing all of the Stone trolls (and ones painted as such) on them. It took awhile to get them done, but hey!